The player is a wolf monster that can transform into a “princess.” In order to heal the blind eyes of the prince, the wolf must guide him by the hand to the depths of the forest to reach the witch’s house. Dangerous monsters and complex challenges await them in the forest. Make proper use of the “princess” and “wolf” forms, and head towards the witch alongside the prince. —The “wolf” can use its powerful strength to break normally unbreakable obstacles. —The “princess” can hold the prince’s hand and cooperate with him. Various challenges await the two in the forest. From obstacles that can only be broken by the wolf’s strength, to switches that can only be pushed by the princess’ hands, and footholds that react to weight, there is a large variety of mechanisms in the forest. Using your wit and ability to transform, find your way past these challenges. —A foothold that goes high and low in response to the weight of what stands atop it—like a weight machine. —The light of the moon shines in through the clouds. Under this light, you can untransform and return to your original monster form. 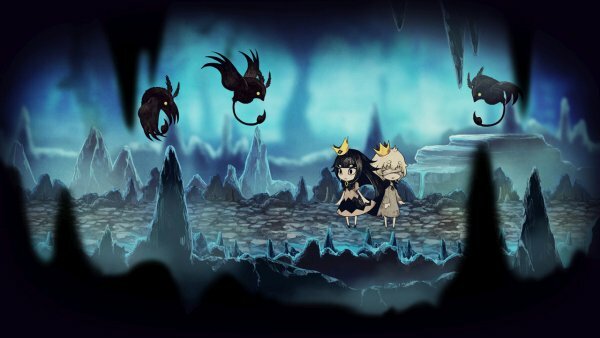 If the wolf is in “princess” form, it can asks “requests” of the prince as a mechanism for solving puzzles. There are two kinds of “requests” you can ask of the prince: “Hold (or Drop)” and “Walk.” Use these to cooperate with the prince and move forward. —Only the prince is able is able to hold things. When he is holding something, you can grab his hand to guide him, or request that he “Walk” and bring what he is holding to the target location. —If you find a fire lantern, you can burn obstacles and light up your surroundings. The wolf (princess) is bad with fire, so only the prince can hold it. Many man-eating monsters live in the forest where the game is set. Proceed with caution in order for the prince and princess to avoid being attacked. —At the very beginning of the forest, you’ll meet a small creature with tufty fur. It moves by crawling on the ground. —A frog-like creature lives where many mushrooms grow in the forest. It jumps up and down while moving. —You will find bird-like creatures in the caves. They are always airborne, and may attack from overhead. As you walk through the forest, you will come across small flower gardens. If you give one of the flowers blooming there to the prince as a present, the prince will gradually tell you of the “Witch Fairy Tale” passed down to him in his kingdom. While this is an optional collection element of the game that is not necessary to clear the story, if you gather all the flowers, the forest witch’s past will become clear… perhaps. —By collecting flowers, the witch’s story is added to the “Album” on the menu screen. You can also replay event scenes at any time from the Album.